Food=Medicine: Cooking with Love – Glass Half Full with Leslie Krongold, Ed.D. In the continuing series, Food=Medicine, Cooking with Love explores different interpretations of how love can be a vital element in the food we eat. 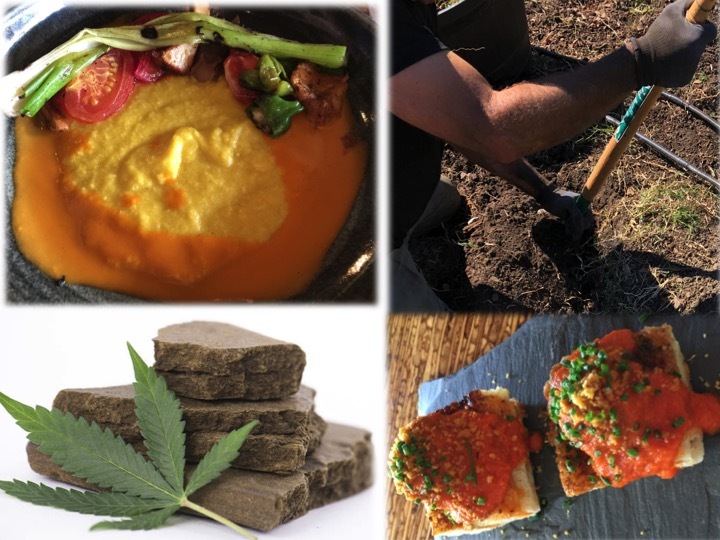 Whether it’s part of the mission of a local organic farm, a vegetarian chef preparing pureed, nutrient-dense food for her father with progressive Parkinson’s disease, or another chef infusing fine dining, multi-coursed meals with cannabis — each guest offers a fresh perspective for mindful eating. Lacey Sher, owner/Chef of the Encuentro pop-up restaurant in Oakland, CA shares two recipes for nutrient-dense smoothies. Aleta Pierce, farm manager for Alameda Point Collaborative’s farm2market program, welcomes farm volunteers and CSA subscribers. Michael Magallanes, San Francisco-based chef, prepares meals for private clients. – sip slow and enjoy! This smoothie is full of colorful foods, such as berries and cacao, which are loaded with a wealth of vitamins and antioxidants to help the body stay strong and vital. Plus with B-vitamin dense maca, omega rich hemp seeds, and beauty boosting coconut oil, this smoothie is filling yet completely whole and natural, assuring optimal function of body and mind. Enjoy! If you truly want to understand the mechanics of dysphagia, check out this recorded webinar with the author of the textbook, Dysphagia: Clinical Management in Adults and Children, Michael E. Groher, Ph.D. It’s about an hour in duration but you’ll have a much better understanding of what this condition is. Here is a community-generated recipe guide for people with swallowing difficulties. Recipes were submitted by caregiving family members. Here is a recorded panel discussion about food preparation for people with dysphagia. Additional resources can be found here. The first Food=Medicine podcast episode included Retired Navy Lieutenant Laura Root and Edibell Stone, LPC & health coach talking about their respective diets. The second Food=Medicine podcast episode featured Jill Nussinow, The Veggie Queen, at the Farm to Fermentation Festival. Jill is a Registered Dietician and author of cookbooks and DVDs. If you want to go deeper into an understanding of fermented foods and their healing properties, check out this episode with fermentation guru, Sandor Katz. This episode explores the ancient tradition of Ayurveda through one woman’s health and diet journey.